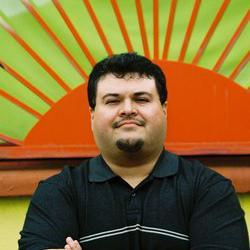 Rio Grande City Public Library is proud to announce children’s author Xavier Garza will read and share stories with children and the community at 5:30pm on Thursday July 28, 2011. Xavier is a prolific writer, artist and storyteller originally from Rio Grande City. Garza has seven published children's books. His newest, "Maximilian and the Mystery of the Guardian Angel: A Bilingual Lucha Libre Thriller," is due out 2011 by Cinco Puntos Press in El Paso. His other books are "Kid Cyclone Fights the Devil and Other Stories" (Cinco Puntos Press, 2010); "Zulema and the Witch Owl" (Piñata Books, 2009); "Charro Claus and the Tejas Kid" (Cinco Puntos Press, 2008); "Juan and the Chupacubras" (Piñata Books, 2006); "Lucha Libre: The Man In The Silver Mask: A Bilingual Cuento" (Cinco Puntos Press, 2005); and "Creepy Creatures and Other Cucuys" (Piñata Books, 2004). He illustrated all of his books except for "Juan and the Chupacubras."